As I've blogged about in the past, I've been really struggling with how to feel about the intersection between feminism (and the rejection of narrow definitions of beauty that come with that) and weight loss (especially when weight loss and health are often correlated, and frequently wrapped together in the messages we receive). I can't say that I've got all of the complexities unwrapped, because I definitely don't. But I can say that I'm in the healthiest place I've ever been when it comes to being happy with my body while focusing on making healthier choices. In fact, looking at the way that I used to approach being healthier and the way that I do now has really helped me understand more about the process it took to get to this place and the progress I still hope to make. Then: I defined "health" almost entirely as weight loss. If I didn't see drops in the numbers on the scale or looser clothes, I considered the whole thing a waste. And my expectations for the speed in which I should see those changes was completely unrealistic. Now: I can't say it's been easy, but I've really been shifting away from thinking about the weight loss. I measure my success in how long I can run without stopping, the distance that I clock at the gym, the number of times I opt for cooking in instead of eating out in a week. These measures are harder to quantify, but they are more real to the thing I really care about, living a healthier life. Then: I weighed myself every day, sometimes more than once a day. As much as I would tell myself that my weight was going to naturally fluctuate, weighing a half pound more one day than the last was enough to put me in a bad mood for the whole day. Now: I weighed myself on the first of January and the first of February. I'd lost five pounds. 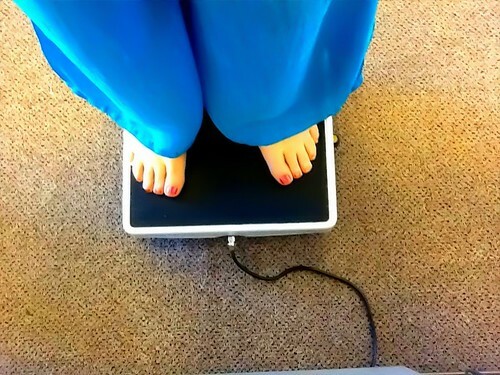 I'm not weighing myself again anytime soon--maybe the first of March. I hate having to think about the numbers constantly. As long as I'm making healthy choices and other measures of my health (blood pressure, mobility, etc.) are working for me, then I'm good with that. Then: Workouts were sporadic and often torturous. I would make a schedule for the week and if one day got messed up, I'd be inclined to call the whole week a wash, as if not working out on Friday somehow made it impossible to workout on Saturday, or--you know--later on Friday. Now: With the exception of the days when I was sick last week, I've worked out every weekday for over a month. Sometimes that workout is an hour long, and sometimes it's thirty minutes. On days when I'm in a real crunch, it's been twenty minutes. When I got the cold and couldn't work out, I didn't feel like a failure. I just looked forward to the days when I would be feeling better and could get back in the groove. When I had planned to work out over my lunch break at 2 and then a meeting came up, I didn't decide that I couldn't work out that day, I took my lunch earlier and made it work. When the weather's cooperating, I walk everywhere I can on the weekends. My daughter gets to play in the park, and I get to be active and outside. I never would have thought to count these little things as healthy habits in my "old" mindset because they don't really translate into rapid weight loss, but they do translate into a healthier mentality. Then: Food was my enemy. I starved myself for half to the day only to overcompensate later. Breakfast was typically Slim Fast. Lunch was some dry Special K cereal and a piece of fruit. I'd chug three cans of Diet Pepsi during the day, and then I would come home and maybe cook dinner. Often, I would convince myself that cooking dinner would take too long and we would eat at Applebee's or grab a rotisserie chicken dinner from the grocery store. At times, I counted calories obsessively. I rarely enjoyed what I was eating. Now: We still eat out every once in a while, but usually only on the weekends and only at a place where I'm guaranteed to actually enjoy the meal. I've stopped drinking soda and juice, and only have water with meals. Breakfast is usually Greek yogurt, fruit and granola. Lunch is leftovers from whatever I made for dinner the night before or something like hummus, black beans, and spinach on tortilla. I'm very rarely hungry, and I like the food that I eat. How many calories are in it? I don't know. I look at labels to make sure that I'm okay with the ingredients and amount of sugar in them. And I know that if I'm not okay with feeding it to my daughter, I shouldn't be okay with eating it myself (with the exception of wine, yummy, yummy wine). If I know that all the food I have is good for me, I spend a lot less time stressing over it. This isn't to say that I've got it all figured out. There are still times when I get down on my body and wish that my clothes fit me differently. There are still days when I really, really don't want to go to the gym and I have to force myself to go. There are still times when I pass a freezer full of ice cream and salivate over the Phish Food. But, overall, I feel like every change I've made is a sustainable change. I'm not worrying about how much longer I have to do this until I reach some magic weight. I feel like these are changes I'm making for life, and if I slip up, I still have a lot of life left to get it right. When I heard people say things like that before, I always thought how overwhelming it sounded to make a longterm change. For life, you say? Pshaw. I just want to do this for a month until I drop my 15 pounds like the people on Biggest Loser. But it's not overwhelming me at all. It's pretty freeing. Bravo to you. Seriously. It's so easy to get caught up in a "diet" and make yourself miserable over it, then quit because you failed once and couldn't get back on track. But making healthy changes that will last a lifetime is harder. But better for you! The only time in my life that I made an effort to shed a few extra pounds - because I was tired of spending the money to always buy new (bigger and bigger) clothes, and I wanted to be in better overall shape before I got pregnant - I did so not by dieting or cutting things out of my life, but by monitoring portion sizes and making healthier substitutions when and where I could. I did it in baby steps, and within a few months I had not only lost 20 pounds, but I was in the best shape of my life because I felt good about exercising and loved the energy I got from eating right. More power to you, girl. Keep it up! Thank you! There are plenty of things in my life that are a chaotic mess, but I really feel like this isn't one of them anymore, and that's pretty comforting. I don't know why I spent so long thinking about health in such a self-destructive way. And I completely agree with you about how much feeling good about your decisions can impact your energy. I am open to that beautiful fulfillment that is my right simply because I exist! I am master of my body; my legs, my arms, my breath, my heart. I am an athlete. I AM EXQUISITE! It changed my life, because I suddenly saw myself in a completely new way. I like to share it because I hope that it can help other people change their own lives. I am not skinny, and I am not buff, but I am in a healthy mental space, and that to me was one of the most important pieces of my puzzle. Thanks for reading! I feel the same way--amazed at my body when it's working out and being strong. The way I used to think about health had me thinking that I had to wait until I hit some (constantly unattainable) goal in the future in order to be impressed with what my body can do, but being impressed with it RIGHT NOW is a lot more fulfilling, and it keeps me motivated a lot longer.